Our design #175 IMOCA Open 60 (ex Acciona) is back! No more details can be supplied at the moment, except to say that we’re working on updates to the design based on the latest 2013 rule to bring her up to date for the next Barcelona World Race. Design work is being undertaken in the areas of ballast, rig, lifting foil assist and the boat will feature a new forged steel fin to the latest rule. Updates will be posted on this site and our Facebook page as soon as we're allowed by the project. 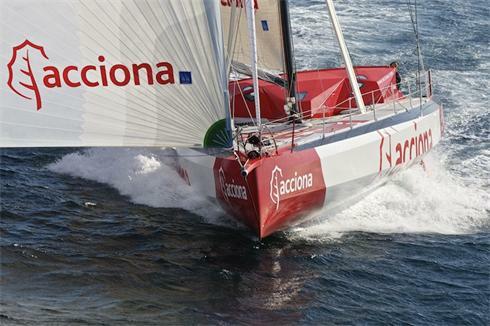 Acciona was Owen Clarke Design's eighth and latest Open 60, Acciona 100% Eco-Powered and the first IMOCA 60 zero emissions ocean racing yacht, to race in the Vendee Globe without fossil fuels (diesel typically) of any kind aboard. Where an IMOCA 60 would normally have a diesel engine for auxiliary drive and power generation this has been designed out and replaced by an electric motor and batteries charged by a system of solar, wind and hydro-generators.